We’re pleased to announce that the holdings of the Institute of Ismaili Studies & ISMC Library have been added to Copac. The Institute of Ismaili Studies & ISMC Library (IIS-ISMC) aims to serve scholarship in areas and languages of interest to the Institute for the Study of Muslim Civilisations and the Institute of Ismaili Studies by emphasising the development of collections of primary and secondary resources, and published and rare materials, in the fields of Islamic studies and Muslim civilisation, as well as in the Humanities in general. 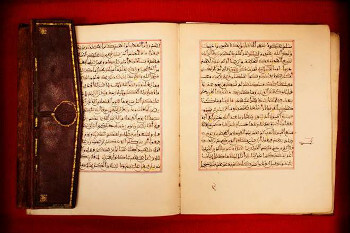 The library gathers materials published in and about the major areas of the Muslim world and their diasporas, as well as their history and evolution, while specifically paying attention to topics such as Ismaili studies, wider Shi’i studies, and Qur’anic studies and education. Among the special collections, library highlights include the donation of the personal library of Professor Annemarie Schimmel, an important collection focusing on the Indo-Muslim communities and cultures, which contains several out of print works in Sindhi, Persian and Urdu; and also the donation of part of the library and personal archive of Professor Mohammed Arkoun, including his professional correspondence, notes, offprints of his articles and over 200 theses on Islamic thought, history and culture. The library also houses an important collection of books in Ottoman Turkish that mainly includes works of literature from the Tanzimat and post-Tanzimat period, particularly novels, poetry and dramas, as well as travel literature, language materials and historical works, dating from the 18th to the early 20th centuries. To browse or limit your search to its holdings, select the Main Search tab in Copac and choose ‘Institute of Ismaili Studies & ISMC Library’ from the list of libraries. This entry was posted in Contributors, Database, database updates, libraries and tagged contributors, database updates, libraries by Ben. Bookmark the permalink.